Experience Japanese culture through music in a fun and energetic taiko workshop at The Japan Foundation, Sydney in Central Park! This workshop is open to primary and high school students—parents and guardians are also welcome. Led by seasoned taiko educators and performers YuNiOn, you will explore a new world of movement and music. Thinking of joining us for an hour of taiko fun? Don’t forget to wear comfortable clothing, bring along some bottled water, and (most importantly) come with a smile on your face and lots of energy. Sense of rhythm is optional, we’re sure you’ll pick it up on the day! YuNiOn is formed by Masae Ikegawa and Graham Hilgendorf, seasoned musicians and spirited performers. They are also experienced educators who are passionate about sharing the unique sound and energy of taiko. 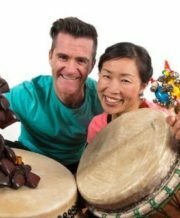 Masae Ikegawa has been teaching and performing for students in Australia since 2000 and Graham Hilgendorf has been working in the Musica Viva in Schools program since 1990. Their range of educational activities range from world drumming to learning Japanese through song and dance. Open to teenagers and school children and their guardians. Walk-in’s welcome depending on availability on the day. Workshop participants: Please wear comfortable clothing. Taiko drums also tend to get loud when lots of people are having fun so please be warned.